Looking for hotels near Malakoff-Plateau de Vanves Metro Station? Offering a shared lounge and free WiFi, La Cle des Expos "In Paris" provides accommodations in Vanves. Hotel Terminus Orléans is located in the 14th district of Paris with Metro Porte d'Orléans and tram stop at the front of the hotel, giving guests direct access to Paris famous sites. Excellent location. Clean and nice room. Excellent host. 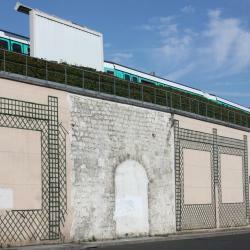 Hotels with great access to Malakoff-Plateau de Vanves Metro Station! Located 0.9 mi from Porte de Versailles Exhibition center, opposite Georges Brassens Park, Hôtel du Home Moderne offers contemporary rooms with free Wi-Fi internet access. The breakfast was very good with a lot of options for a 3s hotel.